If you are using Vectorworks in New Zealand, you should be glad to hear the news, there is now a series of worksheets that are designed to answer the E2 and H1 issues. This is a worksheet that will help you to add up the Risk Factors for your buildings. It is a simple Vectorworks worksheet that counts up the correct score as you enter the Risk Severity. 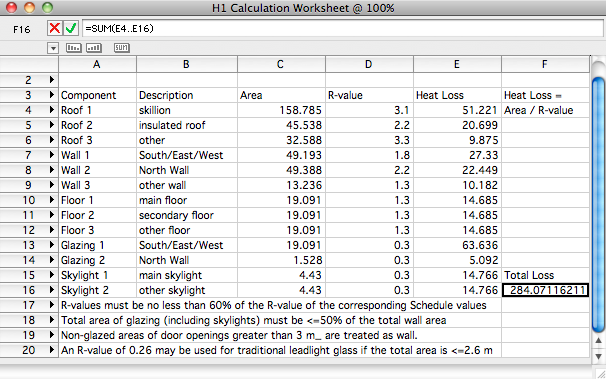 With this worksheet, it is easy to calculate the wall areas and window areas for the insulation calculation. There are some detailed instructions to follow to make sure that the worksheet picks up the correct data, but the instructions are in the file for you. This worksheet finds the area do the roof, walls, windows and so on. When you enter the insulation values for each area, you get a total heat loss, for comparing with the example house. Again, there are some detailed instructions to follow to make sure that the worksheet picks up the correct data, but the instructions are in the file for you. This entry was posted in blog, Library Files, Public Posts, Vectorworks and tagged worksheet by jonathan. Bookmark the permalink. Should have started using these a long time ago! Any idea why I can’t move the Risk Matrix and Instructions on VW 2012? I can cut and paste, but not move or Nudge. Ah ha… moves in a blank document and our design layers, but not our sheet layers!